MTH AIU relay outputs can be used to activate the momentary pushbuttons on wireless remote control transmitter fobs. The AIU SW(itch) port outputs close for exactly 1/2 sec when the Straight or Diverge button is pressed on the DCS remote. The AIU ACC(essory) port output closes for as long as the ACT button is pressed, or indefinitely if the ON/OFF latching buttons are pressed. 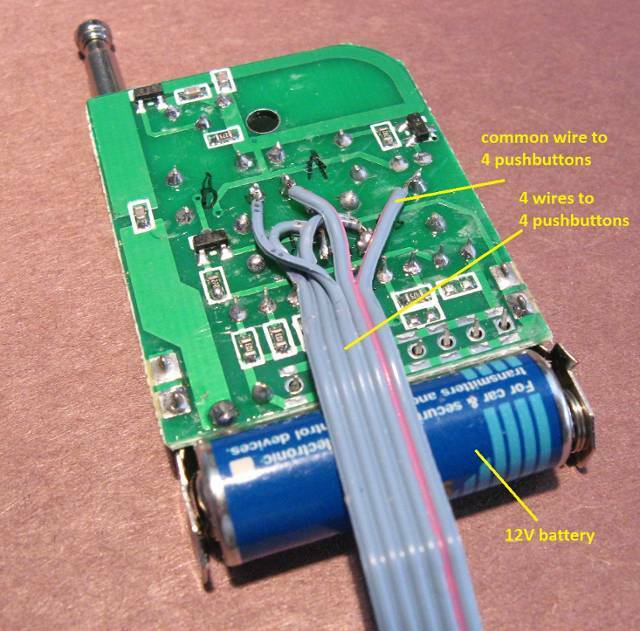 On eBay and elsewhere, there are many low-cost transmitter and receiver components using the somewhat dated but tried-and-true garage-door wireless technology using 315 MHz or 433 MHz RF and basic Amplitude Shift Keying (ASK) coding. These products use the venerable 2262/2272 chip set which can be configured to generate over a thousand unique addresses - enough for any practical train layout. For just a few dollars, you get a 4 channel remote fob and a 4 output receiver. 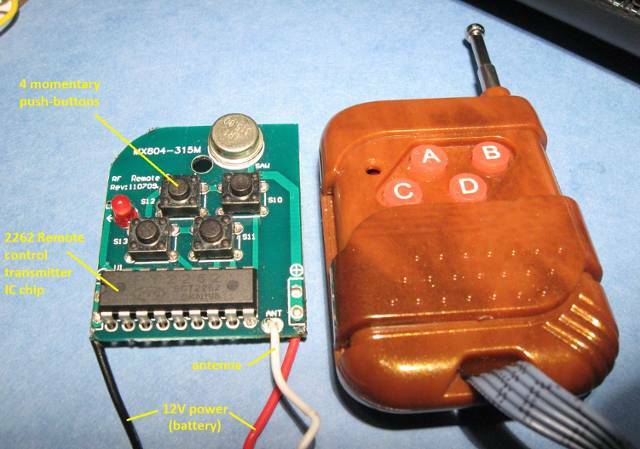 The transmitter is powered by a 12V battery. The receiver requires 5V DC; and one of its 4 digital outputs is activated when the corresponding button is pressed on the transmitter. The low-current digital outputs could then drive a relay or transistor to control the remote load. Or, there are relay receiver modules that integrate one (or more) relays. The idea here is to demonstrate how to attach the AIU to a wireless fob so that ALL remote control can be performed from the DCS handheld remote...rather than having multiple handheld control devices. In the above 4-button remote fob, there are 4 momentary push-button switches. So the idea is to simply tether the 2-terminals for each push-button to the AIU. As it turns out, one of the terminals for each push-button is in common. This common wire means only 5 wires need to be tethered out to the AIU. This common wire will go to the "IN" terminal of the SW(itch) or ACC(essory) ports. And the "IN" terminals will be daisy-chained at the AIU. 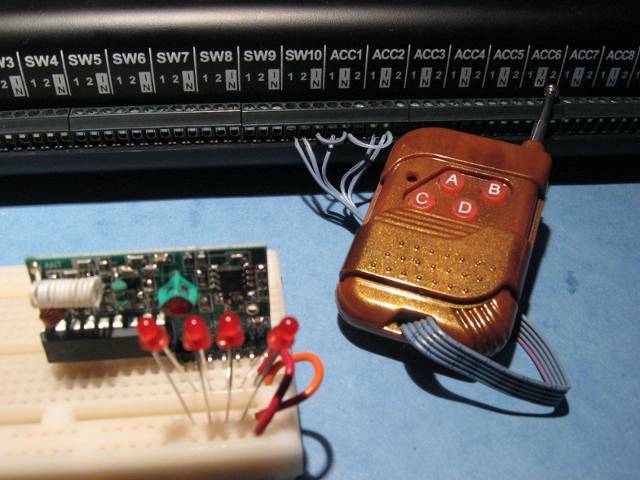 Here is an ACC port in action using 2 buttons to control 2 of the outputs of the 5V receiver. There is enough output current on the receiver to drive a small LED. As discussed earlier, the receiver output would more likely drive a relay or transistor in a practical application. Refer to another thread showing how this exact receiver module controls the action of an MTH operating reefer boxcar. Note that it is unwise to mistakenly press the ON button when using the ACC port. This would continuously activate the remote control transmitter (note red LED on transmitter) until turned OFF. This video shows a SW(itch) port controlling two pushbuttons. The take-away is the exact 1/2 second AIU relay closure when the Straight or Diverge control is pressed is long enough to generate a wireless burst that the receiver can detect and decode. In the above video, the relay module is shown operating in different modes. These relays generally provide 3 operating modes. 1) Momentary, 2) Toggle, 3) Set-Reset. In Momentary, the relay is closed as long as the button is pressed; this is like the ACT button of an Accessory Port. In Toggle, the relay closes and opens on successive button presses (same button). There is no equivalent mode in the AIU. Note that with this method, the Straight and Diverge controls of a single SW(itch) port can control 2 ON/OFF relays. In Set-Reset, the relay closes on one button press and the relay opens on a different button press. This is similar to the ON-OFF (separate buttons) behavior of an ACC port.